For a while, it seemed that Vasek Pospisil was going to become the reigning king of the ITF Futures and ATP Challenger tour, but with no real ATP results to go behind the crown. Amassing an early career of 17 Futures and Challenger titles, along with seven doubles titles, the Vancouver native continued to tread along the world top 200 until his milestone 2013 season. Missing the early part of the year due to mononucleosis, the Canadian continued his success on the Challenger tour and soon started winning matches at ATP events. Reaching two ATP World Tour semifinals in Bogota and Basel, neither would be as impactful as his first ATP Masters 1000 semifinal run in Montreal. Pospisil was able to win a tour-best four matches in a row over then No. 20 John Isner, Radek Stepanek, No. 6 Tomas Berdych (his first top 10 win) and Nikolay Davydenko before falling to countryman Milos Raonic 6-4 1-6 7-6(4). After reaching a career high ranking of No.39 following the tournament, Pospisil looked to build upon his success with coach Frédéric Fontang, a guru of tennis’ technicalities and strict dietician. Within the year, Pospisil would reach his first ATP World Tour final in Washington, again defeated by Raonic, 6-1 6-4, help Canada reach the Davis Cup World Group semifinals for the first time before losing to eventual champs, Serbia, and even win a Grand Slam title. Teaming up for the first time, Pospisil and American Jack Sock made one of the most improbable, yet memorable runs in Wimbledon history in 2014. The unseeded pairing, now affectionately named Popsock, stormed their way into the final with only doubles legends Bob and Mike Bryan standing in their way. After three hours and six minutes of gripping drama, the defending champions were denied their 16th grand slam doubles title, 7-6, 6-7, 6-4, 3-6, 7-5. 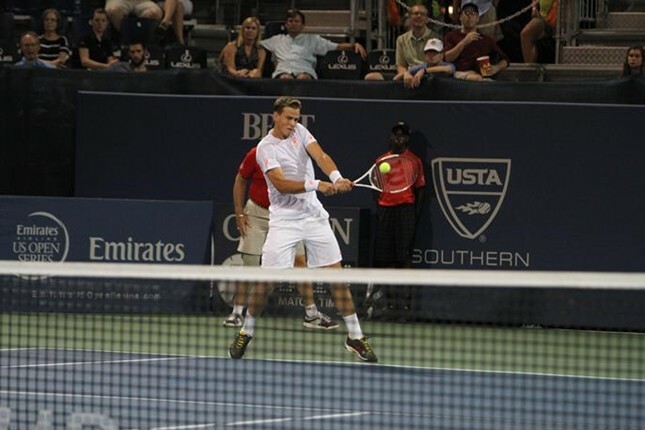 This year, the 25-year old Canadian will be competing in the BB&T Atlanta Open for the second time. As the reigning doubles champ with Sock, the Canadian-American duo look to retain their dominant ways with a fourth title, while Pospisil continues to aim towards his first career singles ATP title.